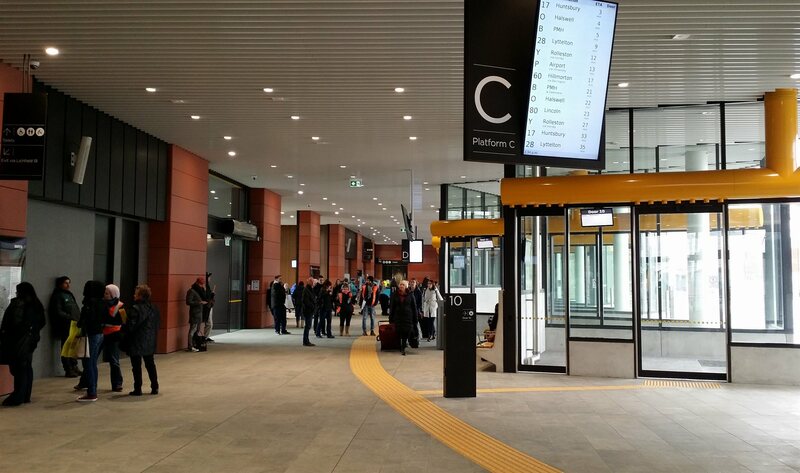 While it’s been partially open for a few months now, with the second stage of the new Christchurch Bus Interchange now completed, it seems timely to have a look at it and see how it works for cycling (we’ll look at the surrounding cycleways in a future post). Let’s start with the interchange itself. 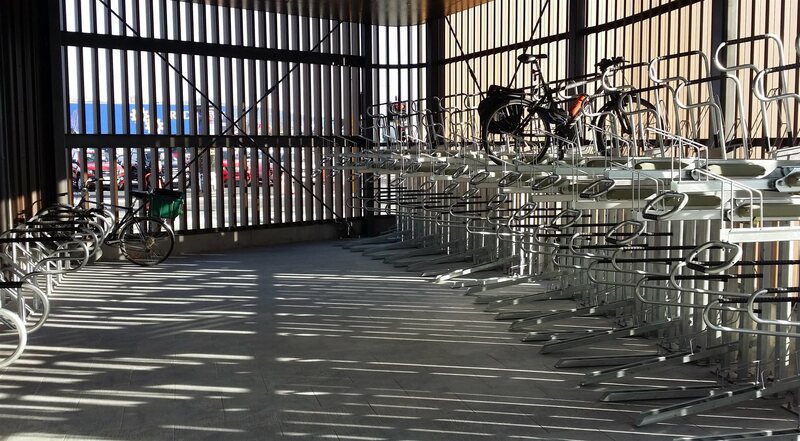 As well as seating, tables, power outlets, and various food outlets soon to open, the Interchange also features space for 100 covered bike racks in the southwest (Colombo/Tuam) corner. You can enter via large automatic sliding doors facing Colombo St, or a smaller sliding door off Tuam St. Some of the bike parking is conventional inverted loop style; there is also some double-decker parking, very similar to what I regularly saw in The Netherlands. Although it looks a bit daunting, it’s relatively easy to slide out the top rack, angle it down, load on your bike, and then lift it up again. But if it’s too much trouble, there’s currently plenty of ground-level parks to use first. 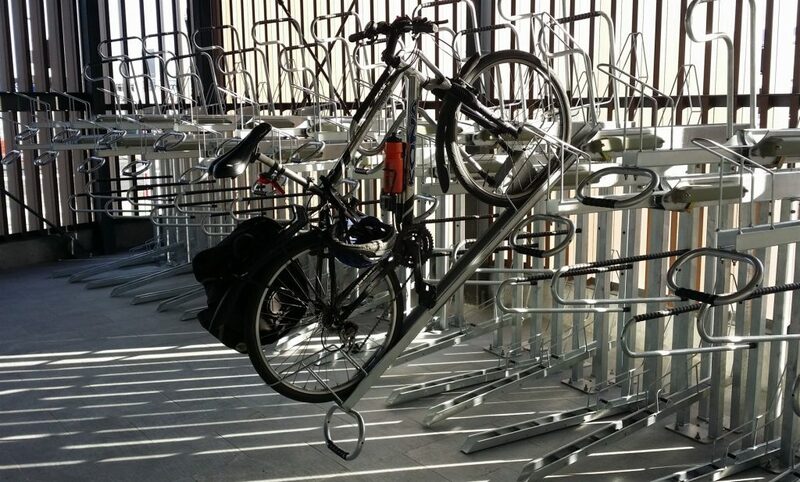 The bike parking is free for anyone to use at any time; security cameras also keep an eye on the parking. There are even some power points to allow you to charge an e-bike. Next door there are also some secure lockers that anyone can use to store gear in. So if you’re coming into town and need a nice place to store your bike and cycling stuff, the Bus Interchange might be just the ticket. The other way to use your bike in the Interchange is to take it on a bus. Unlike the old pre-quake Bus Exchange (when bikes weren’t allowed to go through on buses due to space constraints), this one has been designed to make it easy to do so. Just wheel your bike through the Interchange and find your departing bus platform. 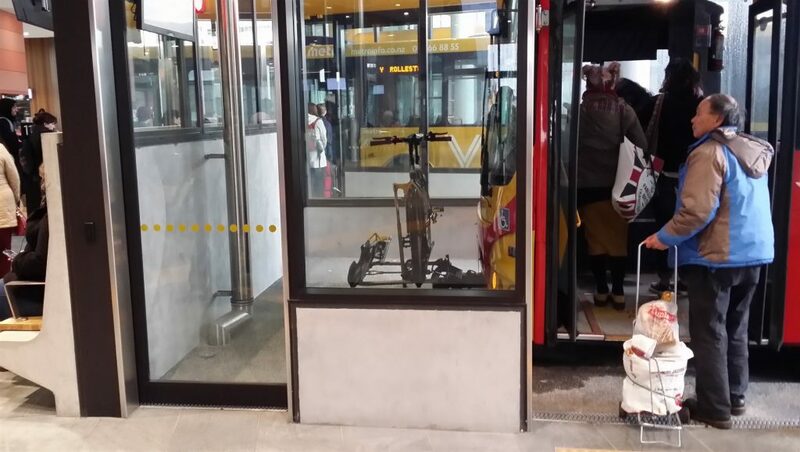 To the left of the main bus entrance door is another smaller door allowing access to the bus rack area in front. Push the button next to the door to slide it open (note: it won’t open until a bus is present). If you haven’t had a chance to experience the Bus Interchange by bike yet, you might want to come along to the City2Sumner Ride, organised by Frocks on Bikes from 11am on Sun 11th Oct. Leaving from the Interchange, participants will ride along some of the new central city cycleways, then through the quiet streets of Linwood and Ferrymead, and on to the new Coastal Pathway section towards Sumner. Then you can ride back – or take a bus! 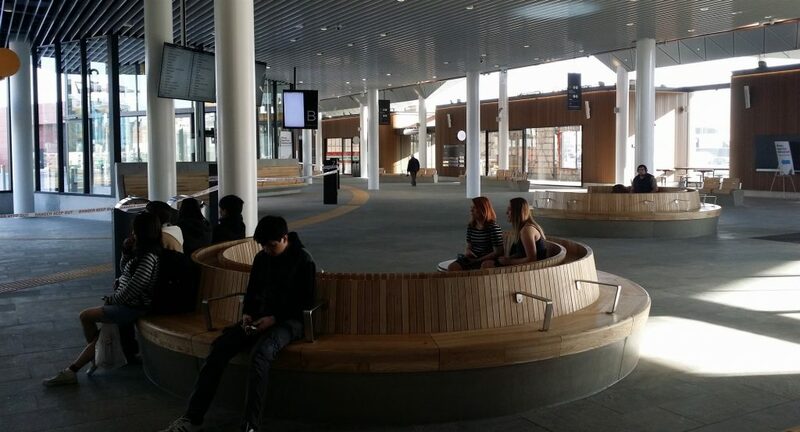 Have you tried the new Bus Interchange with a bike? What do you think? 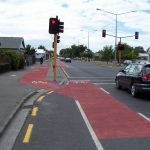 Previous Previous post: Guest Post: Urban Cycling and Urban Planning. Friends or Foes?